Robotic Hair Transplant is one of the most modern methods for hair transplant in order to treat baldness. It is a significant progress in the technique used for follicular unit extraction (FUE) procedure. How is the Robotic Hair Transplant procedure preformed? The new and advanced Robotic Hair Transplant system is the ARTAS Robotic System. This is useful in automating the process of follicular unit extraction (FUE) and allows unmatched precision in performing successful Hair Transplant. There are a large number of advantages of using the ARTAS Robotic System for hair transplant which makes it a more popular choice than the other conventional FUE and Hair Transplant procedures. The ARTAS robotic system is comprised of a robotic limb with hair extraction and site creation tools attached to it, a video imaging system and a specialized computer user interface (control panel). The extraction unit has a double-punch system with an inner sharp punch and an outer dull punch. The process is performed using advanced image-guidance technology which allows for microscopic precision in extraction and preparing the recipient site. This system is efficient and capable of locating and extracting the follicular units as programmed by the cosmetic doctor. This robotic system performs the same hair unit extraction task with constant precision hundreds to thousands of times during the procedure with the same accuracy and diligence which is not achievable through manual hair follicle unit extraction method. This robotic system is also programmable to prepare the recipient site for the cosmetic specialist to transplant the harvested hair follicle units as desired and designed by the cosmetic specialists according to the requirement with high precision. What are the advantages of the Robotic Hair Transplant procedure? The procedure for manually extracting hundreds and thousands of hair follicle units is a tedious and tiresome task which requires several sessions (or one long session) for extracting the desired amount of hair follicle units. Robotic Hair Transplant task is made more difficult as the surgeon (cosmetic specialist) has to visually guess the number of hair follicles to be extracted and has to make perfectly-angled incisions numerous times to remove the hair follicle unit without damaging the scalp or the harvested follicular units. The ARTAS robotic hair transplant system minimizes not only the time required to extract the desired number of hair follicle units, but it also does it with more efficiency and precision which improves the quality of the hair transplant procedure. This system also decreases the margin of error that arises in a manual preparation of the recipient site. This system makes perfectly-aligned and spaced tiny holes in the recipient site according to the parameters defined and programmed by the cosmetic surgeon, such as the angle of elevation of the hair, direction the hair is growing in general, depth of the recipient site, average density and spacing as well as the total number of incisions required at the recipient site. These steps are performed with greater precision and accuracy than the manual procedure results in. This system is also able to identify the follicular units with more hair which makes the harvesting time shorter and easier. Higher accuracy for harvesting the graft hair. Better quality of the harvested follicular units. Decreased harvesting time for hair follicular units. Computerized detection of dense hair follicle units helps to maximize efficiency as well as reduce risk of wounding the scalp. Side of the scalp provides for easier extraction of hair follicles. Easier hair extraction for patients with differing racial background or a typical hair type. Increased accuracy and speed of preparing the recipient site. The ARTAS robotic system is one of the most advanced and highly advantageous hair transplant system which handles the process of hair unit extraction as well preparing the recipient site with utmost precision and accuracy in a shorter period of time than that required for a manual Hair Transplant procedure. 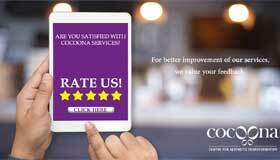 People from all over the world visit the advanced and most high-tech Cocoona Center for Aesthetic Transformation for getting the best, most efficient and most affordable Robotic Hair Transplant procedure in India.